The traditional December Season has become bigger and longer over the years. The season does not extend beyond January, but begins early. For the past few years, The Hindu, a leading newspaper of south India has been hosting the November Fest. 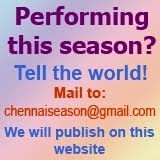 Initially organised in Chennai, now the fest goes to other cities like Coimbatore, Bangalore, Kochi and Hyderabad. This fest includes other genres of music too. Carnatica, another organisation hosts Bharat Sangeet Utsav in November. 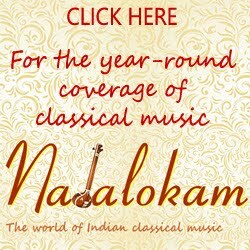 This series also includes Hindustani and other classical combinations of jugalbandhis. The schedule of these fests will also be put up on this website soon. Do come back and enjoy the music. Annual Vani Kala Sudhakara awards for musicians and dancers are awarded by Sri Thyaga Brahma Gana Sabha during the December music festival every year. This years awardees include senior musicians R.K.Srikantan for Vocal, V.V.Subramaniam for Violin, Trichy Sankaran for Mridangam, senior dancer Lakshmi Viswanathan for Bharathanatyam and P.S. Sachu for Theatre. The music festival will be on from Dec. 9, 2013 till Jan. 15, 2014. Vocalist Smt. 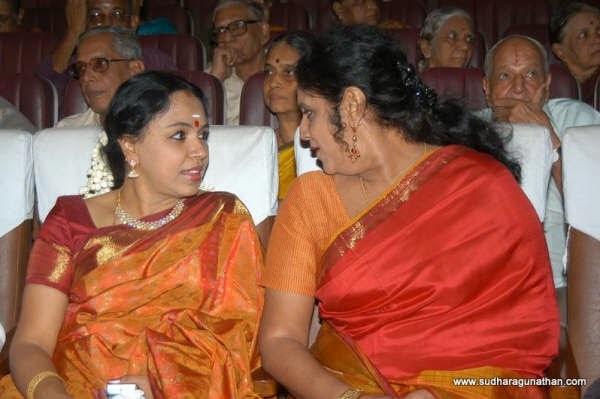 Sudha Ragunathan is chosen for the title of 'Sangita Kalanidhi' from the prestigious Music Academy, Madras, this year. She will preside over the 87th Annual Conference of the Music Academy to be held from Dec. 15, 2013 to Jan.1, 2014.She will be conferred the 'Sangita Kalanidhi' title at the Sadas on Jan. 1, 2014. The awards were announced in July this year. The Pappa Venkataramiah Award for violin is being given to Shri H.K. Narasimhamurthy. The above awards will also be conferred at the Sadas on Jan. 1, 2014. The Natya Kala Acharya Award for Dance, instituted two years ago, would go to eminent Bharatanatyam exponent Chitra Visweswaran. This award will be given away at the inaugural function of the Dance Festival on Jan. 3, 2014. Season 2013 is ahead! Welcome! Yet another December Music Season is ushering in. A couple of organisers have already released the season's concert schedules. Some organisations are already on the job of compiling the schedules for print publications. Concert-goers are also busy shopping for the season. The performers are getting their new gadgets and costumes for their music and dance recitals. The rasikas are mailing in bunches to query the schedule, season tickets availability. The team Chennai December Season is getting busy to do their job of sharing all that a rasika would want to know and hear about the season.